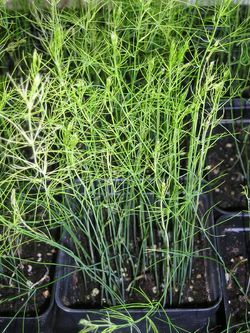 MARY WASHINGTON ASPARAGUS is an American heirloom that produces strong, thick, dark shoots with tight heads from May - June. I can tell you that I have always had better results growing asparagus from seed than from crowns, which can rot in a wet Spring or dry out before establishing themselves. And you really don't have to wait any longer than with crowns. In just 2-3 years you can begin harvesting the early spears, which will thicken with each subsequent year. A properly managed asparagus bed will serve you for up to 30 years! But only harvest a few that first season and let the rest remain to gather food for subsequent season production. These are seed-sown plants, offered in 4" pots with multiple stems per pot. You will receive one pot in Spring at a time safe for transit to your area. You will gently release from the pot and spread with your fingers before transplanting to your prepared bed. It is not necessary to separate to individual stems. I have done this before with spectacular results. ABOUT ASPARAGUS: Asparagus is a hardy perennial. It is the only common vegetable that grows wild along roadsides and railroad tracks over a large part of the country. (Remember the foraging classic by Gibbons, "Stalking The Wild Asparagus"?) Asparagus is native to the Mediterranean and was eaten by the ancient Greeks. Asparagus is nutrient-dense: high in Folic Acid and a good source of potassium, fiber, Vitamins B6, A, C and thiamin. Asparagus has no fat, no cholesterol and is low in sodium AND calories. It is one of the richest sources of rutin, a compound which strengthens capillary walls. It also contains glutathione - one of the most potent anticarcinopgens and antioxidants found. It is also delicious! Don't be alarmed when your urine has a distinctive odor after eating asparagus - this is normal and passes. Asparagus has diuretic properties so it is good for your kidneys! GROWING TIP: A member of the Lily family, asparagus forms a crown which sends up spears for a 6-7 week period in the spring and summer. Under ideal conditions, one spear can grow 10" in a 24 hours period, so when production begins each year, check your bed daily. (It is the outdoor nighttime temperature that determines production speed.) Although establishing a good asparagus bed requires considerable work, your efforts will be rewarded. A well-planned bed can last from 20 to 30 years. For this reason, asparagus should be planted at the side or end of the garden, where it will not be disturbed by normal garden cultivation. Asparagus is one of the first vegetables ready to harvest in the spring. 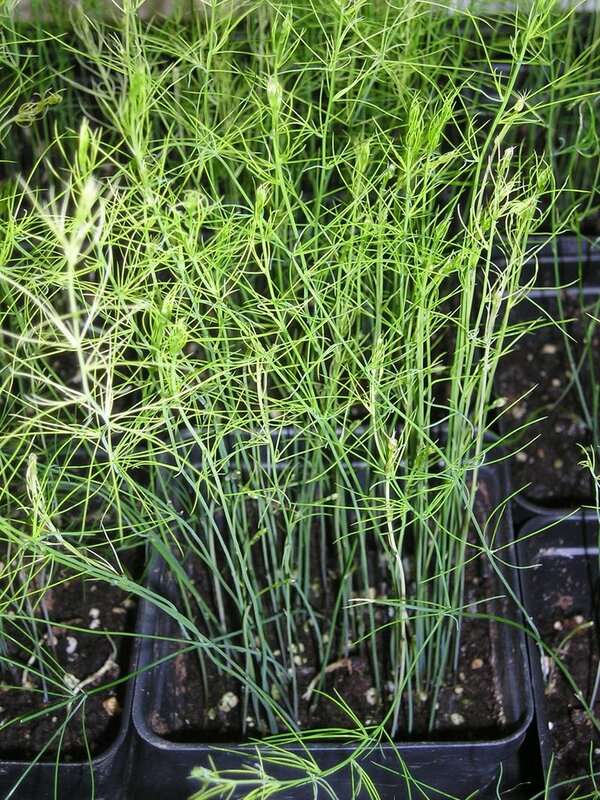 Asparagus seed is slow to germinate, especially in the spring. 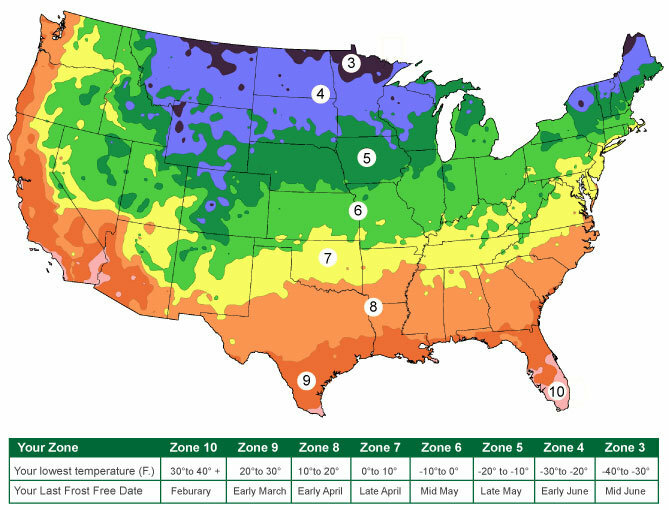 Germination is dictated by soil temperature -- so if planting in Spring you might be looking at 50+ days to germination; whereas if planting in summer (even at soil temps of 95 degrees) you might be looking at germination of 20 days. Over 95 degrees it starts slowing down again. Create your asparagus bed in a protected corner of your garden where foot traffic will be at an absolute minimum, but where you can easily access for purposes of cultivation. Till the earth deeply (to a depth of 12 - 18"), removing any rocks, twigs, etc. Heavily compost and fertilize to prepare the bed. Although asparagus does best in areas where there is a killing freeze each year, wait until danger of frost is passed to initial sow. Then direct sow to a depth of 1/2" and 6" apart and cover seed bed with a thick bed of grass cuttings until the ferns begin to appear. 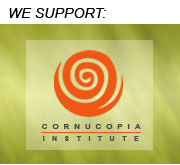 Be sure to keep the seed bed well weeded and the surface of the soil lightly cultivated around the emerging ferns. The roots will take two years to develop and they develop laterally, so do not disturb in your cultivation. Spears emerging the first year should be left. Only harvest a few the second. You will note that the ferns produce little white flowers (see photo below) and then red berries. Do not cut down any of this growth until it turns brown in the fall - it is all part of the process by which your asparagus gathers energy to grow! By the third or fourth year, you are on your way to a generation of enjoyment! SEED SAVING: Asparagus produces orange to reddish "berries" the stalks not harvested. Let them remain on the stalks until mid-to-late fall, then pick and let them dry indoors in a paper bag. When dry, simply gently crush the berries in your hands and winnow out the seeds.